Yes, we did say there were three songs recorded late last year. So far we’ve given you a listen to the first two tracks: What’s It Gonna Be? and The Taste. Now finally, after much stalling (hey, ya gotta admit the last blog post was pretty cool! ), we’re giving you the final track from the latest Nitidus studio sessions: 21 Alibis! OK, so we already had that song online before, but that was the demo version. Now finally 21 Alibis gets the proper studio treatment and it’s available in all it’s glory on Myspace and also on our new Facebook page. Go check it out and hear the difference for yourself, we think you’ll be impressed. Track number 2 off our recent studio venture is now online and available for all to hear. Tonight we bring our popular rock ballad “What’s It Gonna Be?” to you via Myspace for your listening pleasure. Inspired by a friend torn up over a lover, this song demonstrates another side of Nitidus. Get on over to Myspace and have a listen to this brand new track! Photos are now up from last Saturday’s wild night at Twentyfirst Century Club in Frankston. Check ’em out. 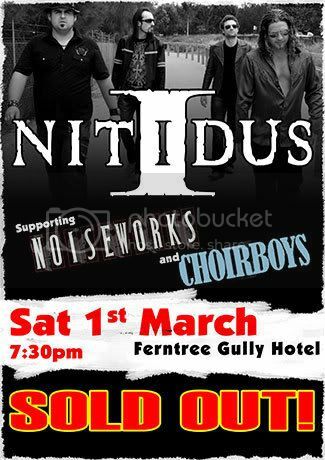 Thanks to everyone who came out to see the last Nitidus rock show for 2007. We’ll be back with a vengeance in 2008! Hey guys, the new tracks are coming along great. All that time on the road perfecting the songs and our performance has paid off in a big way! This recording is seriously leaps and bounds over anything we’ve ever done before. Can’t wait to let you all listen in on what we’ve been cookin’. Bass, guitar and vocals are now all complete and it’s now down to Adrian to weave his magic on the mix. Check out some shots from the last few sessions. We’re heading back to the studio again tonight to hopefully complete the final mix. Stay tuned. So… why are Nitidus in the studio now? Why the sudden rush to record new tracks? Well those who have been to the shows this year will know we’ve got a lot of new stuff just waiting to be recorded, so it’s good to finally take these fan favourites from the live show and turn them into something to shake your home stereo (or iPod). But this recording is not just for the joy of making music. 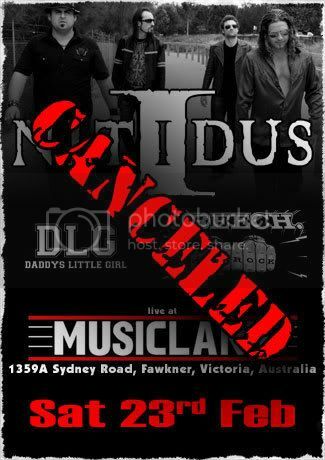 It has been a poorly kept secret that Nitidus have been attracting some significant label interest in the last few months since even before our 21 Alibis tour of the USA. These new tracks will be forwarded to some very powerful folks in the music biz, potentially sealing a record deal… but more on this tantalising development later. Nitidus are back in the studio! Last Sunday, the band commenced recording three new tracks with long-time producer Adrian Hannan (Taxi Ride, Lee Harding, The Androids). Doctor K completed drum tracking at a secret location on Sunday 19th November, with Marki scheduled to commence bass guitar tracking on Thursday 22nd November at The Songstore. 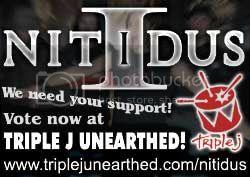 When we say Nitidus means honest, hard working rock band, you know we ain’t kiddin’ around. Over the last six months we have toured the United States of America, signed on new management, attended the ARIAs, rocked out with Diesel and more. Now as we prepare for the biggest rock show of 2007 with Airbourne next month… we decided it’s a good time to hit the studio. Thanks to pre-production recordings made earlier in the year, we’re able jump right in to produce some great tracks.